We first heard of Sticky Holsters when a GunLink Forum member brought them to our attention after speaking with company reps at the NRA show back in 2012. We took the opportunity to visit with them at the following SHOT Show, where company owner Mike Christoff told us about the product and offered us the chance to try one out. The in-booth product demo and trying out one for myself must have paid off; since then I have purchased a number of other sticky holsters for various firearms. While they don't see everyday use as my go-to EDC holster, they do get enough use to have racked up hundreds of days of use in a variety of situations, manners of dress, and methods of carry. 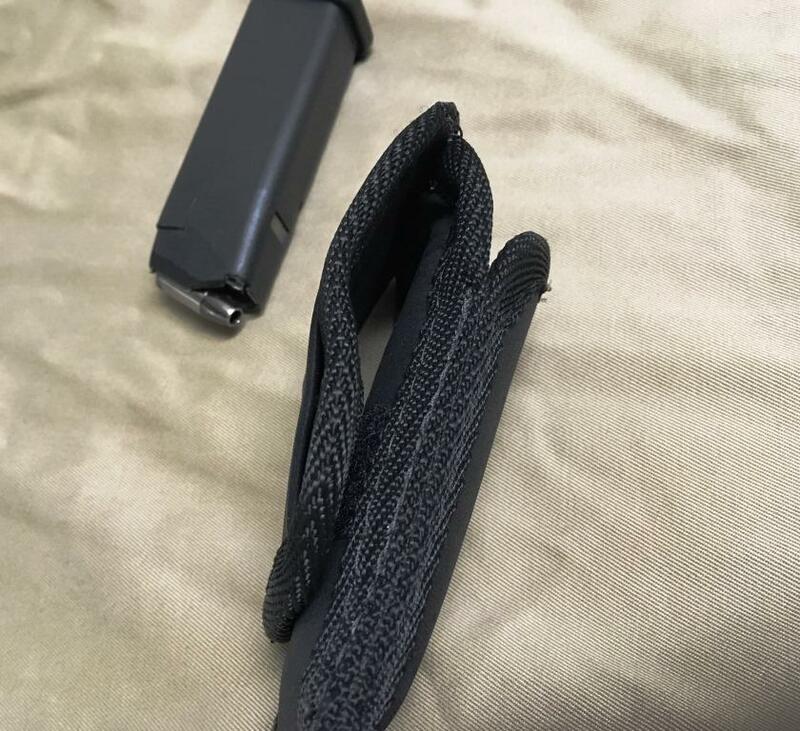 In our initial review of the sample that Mike provided, we were well pleased with the performance of the holster, noting only a few points of contention, such as the rear sight of certain firearms snagging on the edge material - which we note is now addressed in the Sticky Holsters website FAQ. Now, fully four years later, our collection of sticky holsters is still going strong. That collection includes a small one for carrying pocket guns like the LCP, a medium one for J-frame revolvers IWB or pocket carry in the right pockets, a medium one for an XDs 45 3.3, and a large Glock 19 sized one. It's like a CCW version of Goldilocks, but they're all just right for their individual guns. 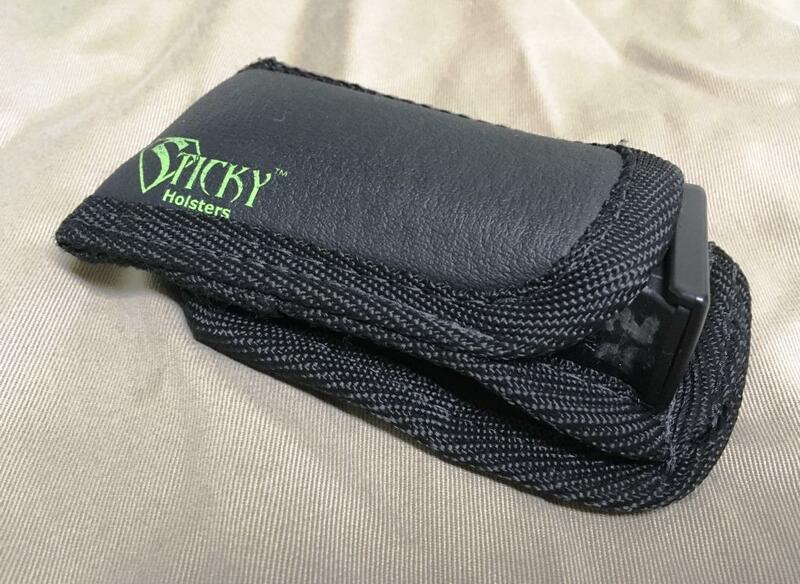 The concept of the Sticky Holster is a pretty simple one: a soft IWB holster that, instead of clipping to your belt or waistband, relies on friction between your person and the waistband of your pants. As it turns out, although they excel at it, the holsters are good for a lot more than just IWB carry. As mentioned, the Sticky is not my top choice for EDC, primarily because I like the extra security that having a belt clip provides. That said, in the many, many days that I have carried IWB in a Sticky Holster, it has proven to be comfortable all day and to stay where I put it without changing cant or position or showing any sign of wanting to take a trip down my pant leg. The sticky is very easy to put on and take off. No dropping trou, no threading belts through loops, no gymnastics. Just pull out your waistband where you want it, place the holster, and let go. This ease of donning and doffing the holster not only makes it great for quick trips to the corner store (if you, for some reason, weren't already carrying at home), but also makes it easier to change your mode of carry. Say, if you are going on a trip and carrying IWB, when you get into your vehicle, it is easy to remove the holster and put it between your seats - not only making your ride more comfortable but making it easier to access your firearm without fighting your seatbelt and clothing should you need it in a hurry. Depending on the size of your holster and firearm, Sticky Holsters also do a bang up job as pocket holsters. I typically do not like carrying pistols so small that they drop into a pocket, but some situations and dress requirements call for more discretion through smaller, less obvious firearms. I have pocket carried each of a micro 9, Ruger LCP .380, and even up to a S&W 442 using sticky holsters and, in all cases, they performed very well. They keep the firearm properly oriented in the pocket, they help breakup the outline of the firearm, and, unless you have extremely loose pockets, they stay in place when you draw from your pocket instead of coming out with the handgun. The holsters are nice and thin, so they don't add a lot of bulk to the holster and, despite the risk of moving around due to sticky surface area, they still work well IWB, giving you the flexibility of pocket carry or IWB for small handguns. 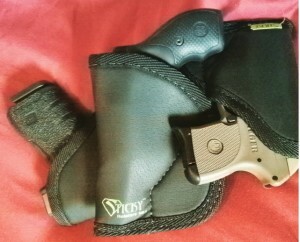 The Sticky is, indeed, a very versatile holster, allowing IWB carry, pocket carry, and various means of off body carry. As noted above, it works great on road trips stuffed between the seats of your vehicle - holding securely in place through acceleration, deceleration, twists, and turns while remaining fairly well out of site and easy to access. It also works well in purses or bags as we do with small guns in the front pocket or larger guns in the rear pocket of our Sidekick on hikes. In situations where you want to have your handgun with you but don't necessarily need immediate access, I like using the sticky holster to keep my full size pistols correctly oriented and protected in the admin pouch of my almost-EDC 5.11 Rush 12 pack. 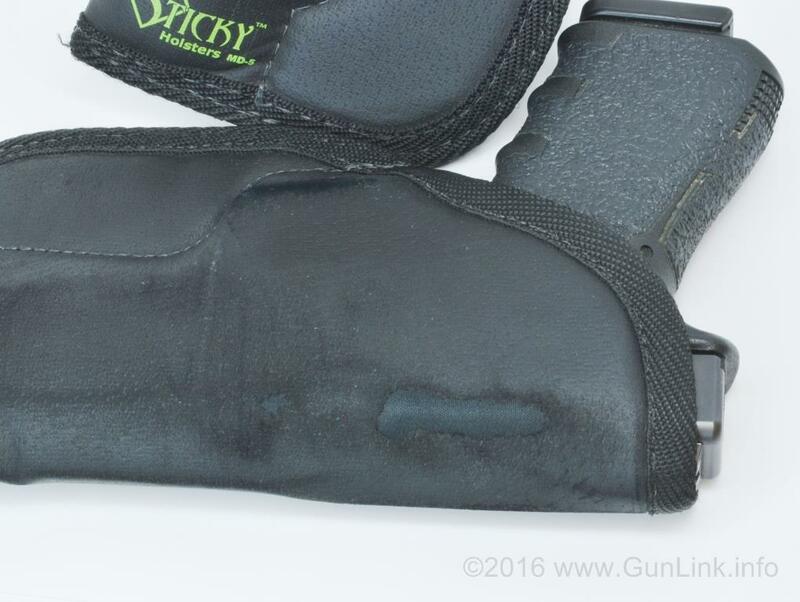 The "minor abrasions" that we mentioned in our initial review have since grown to bigger, uglier patches of missing sticky material on the outside of the holster over the years, something that the Sticky website says they consider to be normal wear and tear. Logically, the wear spots occur mainly on the high spots of the firearm (slide corners, ejection port edges, etc.) and mainly where the holster has pressure on it (across where your belt rides. 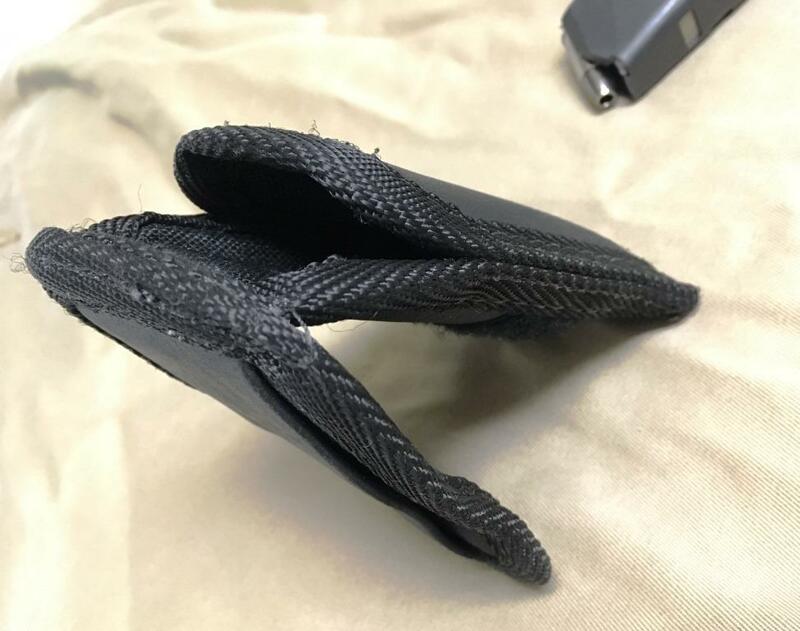 Although it is not pretty, given the large surface area of the sticky material, this has not seemed to degrade the holster's performance much, if at all. Other than that, the holsters are holding up very well, even wearing themselves into a custom fit for each firearm over time. For under $30, we think that Sticky Holsters offer a lot of versatility and value. Although, with the choice provided by my giant box-o-holsters at my disposal, I do not personally prefer them for my own EDC, I know many customers at my local gun store who use them for exactly that purpose with no issues. Since I do not use the Sticky as my EDC, we can't speak directly to how well or how long they hold up to all-day-every-day wear over years of use, but we have put a fair amount of use into outs and they seem to be very robust. If you are looking for an affordable, easy to use, versatile holster, the Sticky is definitely worth a look. 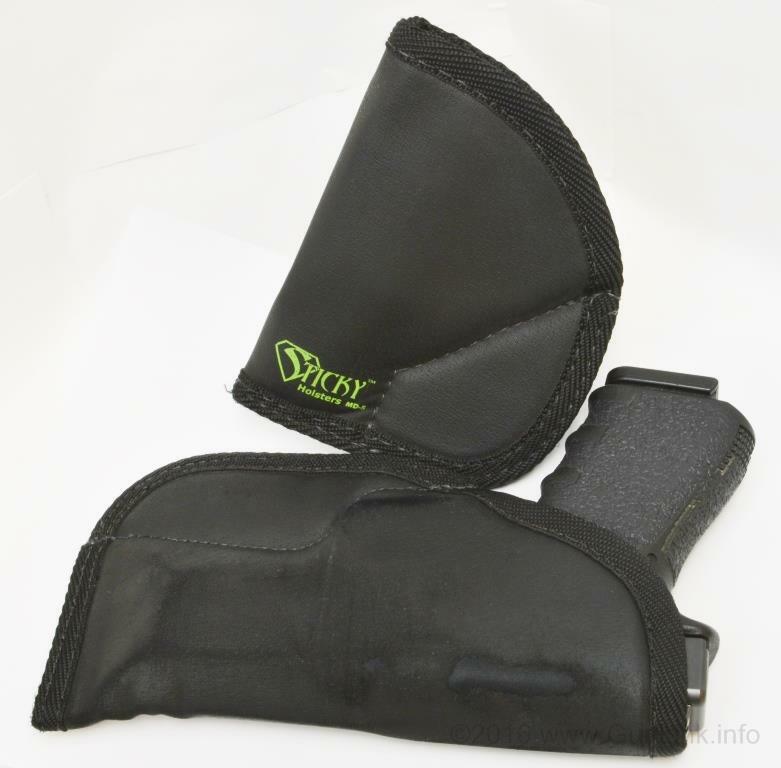 Sticky Holsters also makes a variety of other CCW gear, including magazine carriers. Watch this thread below for reviews of those. With a full stable of Sticky IWB holsters for everything from pocket guns to wheel guns to sub-compact single stacks to full-sized double stack autos, the next logical step was to try out some other Sticky Holsters gear. Next in line was the Sticky Holster Super Mag Pouch. It's a magazine carrier, and a pretty simple one at that, so it doesn't really need a big drawn out review, but it does have some features and functionalities to point out. The basic idea of the Sticky Super Mag Pouch is... well, basic. It's not quite as basic as the holsters themselves, but it is pretty close. The mag pouch starts out with the same design as the holsters - a simple "sticky" sleeve that fits the magazine, but then it has an additional sticky flap sewn onto it at the top and a velcro closure to attach it at the bottom. While the mag pouch could still probably be carried IWB using only friction, like the holsters do, they don't have much surface area to grip on. The extra flap provides a few more options for carry. 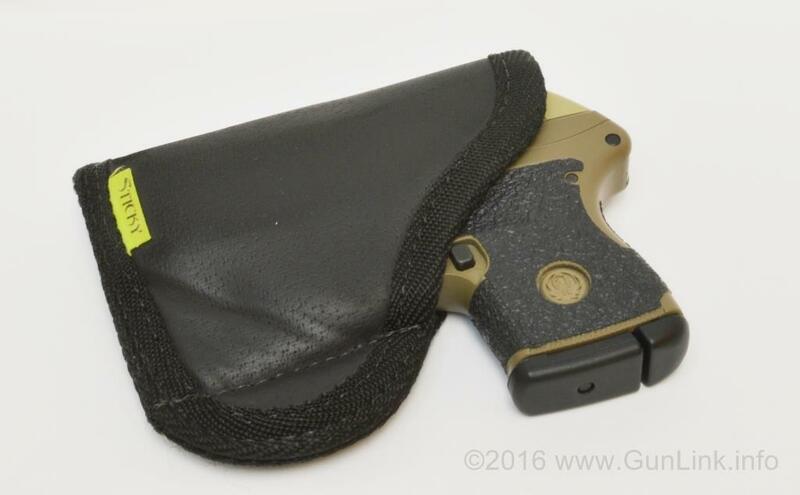 The mag-body portion of the pouch can be tucked IWB as usual for maximum concealment, or the flap can be left hanging out on the outside between the waistband and belt to help keep it in place and not sliding down your leg. Alternatively, with the flap velcroed back down to the main pouch around your belt, the Super Mag Pouch makes a great traditional OWB magazine carrier. Weak-side OWB is how I carry my reloads in the Sticky pouch most of the time. The velcro keeps it in place just fine and, even if the pouch gets caught on something and the velcro lets go, the sticky material held between your belt and waistband keeps it held securely. 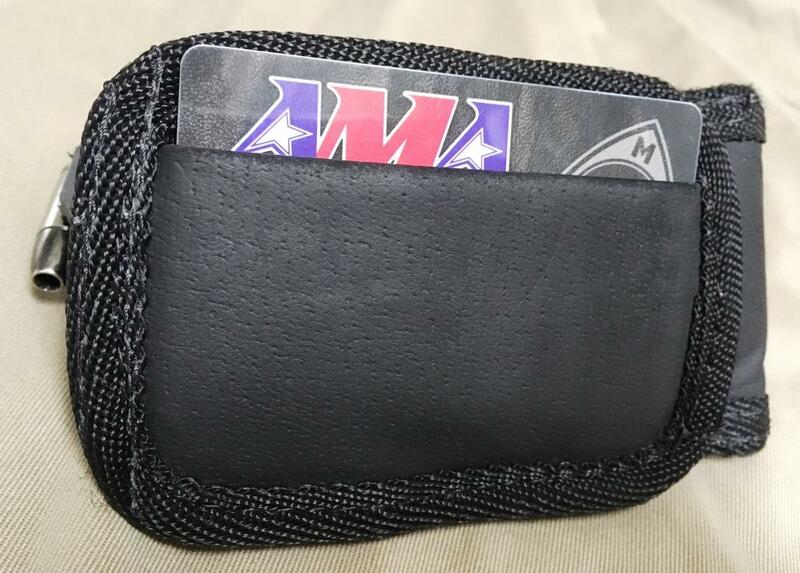 The flap also has a pocket sewn into it like Sticky's minimalist wallets have that allows you to keep credit card sized cards in it. I guess the idea is to hold your ID, CCW license, etc. but I don't carry anything in it since it is not always something that I have with me and my wallet serves that purpose just fine. After a few days of OWB wear, which can wrinkle up the flap, I might stick a card in the flap to straighten it back out. The second most frequent way that I use the pouch is probably the most basic that it could be: just a simple sleeve to keep junk out of the magazine. If I'm not carrying it OWB, I'm carrying it in a cargo or carpenter pocket, so I don't want dirt, lint, or any other random pocket stuff getting in there to cause potential malfunctions. If I'm not carrying it at all, I leave a spare mag in it so it's easy to find, easy to grab, and protected from dust and nightstand stuff. As seen in the photos, I generally use it for a double stack Glock magazine, which is probably the size of magazine that it is best suited for. A G19 mag fits pretty flush, a G17 mag sticks out enough to get a good grip with a couple of fingers. Single stack magazines might have some extra room to flop around and short magazines have plenty of room to fall all the way down into the pouch. The company "solves" this issue by providing a small strip of sticky material with the pouch to lie behind the magazine to take up extra space or to ball up in the bottom to keep the magazine from falling in. I've tried both methods with my pouches and did not particularly care for either. If you carry a pistol with small mags, it may work fine for you, but I think I'll stick with using it for double stack or staggered 9mm magazines and maybe some thicker .45 magazines. As you may have gathered, we appreciate the simplicity and ease of use of Sticky Holsters for an uncomplicated method of IWB and off-body carry. 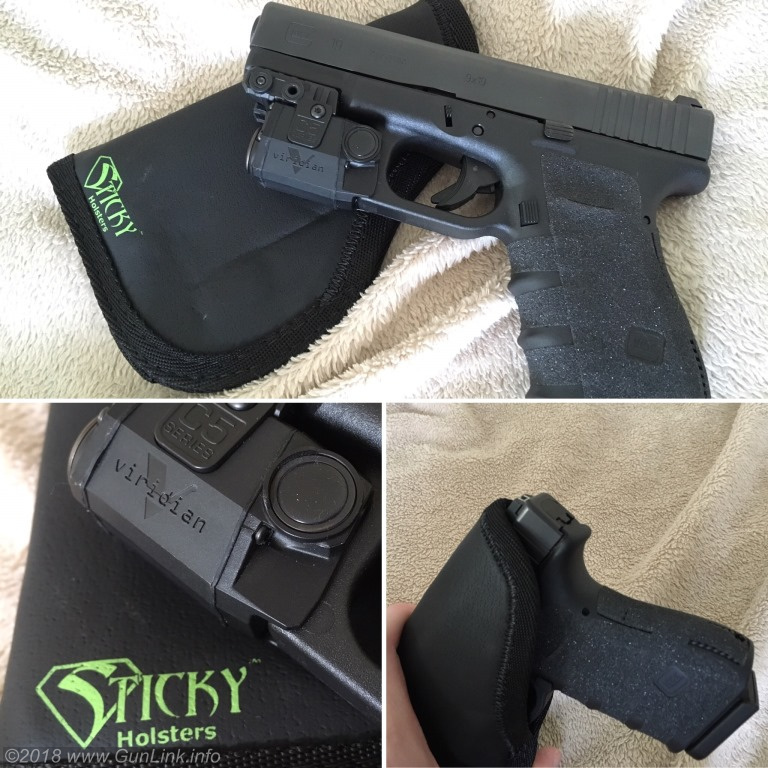 We recently had the opportunity to try out a new holster from the Sticky Holsters Custom Shop when they answered a question that we posted on Instagram: "Who makes a decent ECR holster for Viridian light/laser combos?" 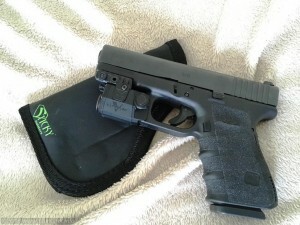 Here's how our Sticky Holsters ECR-compatible Glock 19 holster is working out. In case you are not familiar with Viridian's Enhanced Combat Readiness (ECR) system, check out our Viridian C5L Light/Laser Combo Review here. Essentially, the system allows the WML to be turned ON in the desired mode and holstered. Upon holstering, the output of the unit is turned off. The WML then sits there on the pistol, waiting to be drawn from the holster, at which time it springs into action, turning back on in the mode that it was in when you holstered it. It sounds like a pretty cool feature, because it really kind of is. There isn't any magic or voodoo going in - presumably it works through the use of an integrated reed switch in the WML and magnets embedded in the holster - yet our DIY attempts at creating our own ECR holster failed miserably and the Serpa-style holster that came with it sucked. Sticky Holsters reached out to us and let us know that creating an ECR holster would be a piece of cake for their holster makers. Before long, Sticky had the new ECR compatible holster inbound to GunLink HQ and we got to try it out for ourselves. Granted, the style and intended use of the Sticky (small, IWB, concealed carry) and the Serpa that we bought with the Viridian (big, OWB, duty or open carry, retention), but for our applications, the Sticky Holster is leaps and bounds better. At first I thought that they forgot to add the ECR feature because I didn't see a big scar across the side of the holster or feel the insert. It turns out that the Sticky crew is just really good. I eventually found the clean stitching on the inside of the holster where they hid the insert, which is much sleeker than the big, fat button that came in the Viridian upgrade kit. Like the other stack of Sticky Holsters that we have, this one keeps the firearm in place inside the waistband at various positions in all but the loosest of garments, keeps the pistol within reach when used for car carry, and protects the trigger and keeps lint and other junk out when carried off body in a bag or, like we often do, when setting the pistol somewhere nearby while working out or lounging around the ranch if we aren't wearing it. The ECR feature works exactly as intended, turning the activated WML off when holstering and back on when removed from the holster. Check out our Instagram videos of the WML on a Glock G19 being holstered and unholstered and another video that makes it clearer what is happening from the outside of the holster. While we think that the ECR feature is cool for quick light activation and "Combat Readiness" but that isn't the main reason why we like this custom holster. First of all, I like not smashing my pistol into every door frame through which I walk or catching it on chairs, seatbelts, etc. The main reason we like it, however, is to prevent accidental activation while in the holster. This isn't a concern with hard polymer holsters, but on semi-soft hybrids or fully soft holsters carried IWB, there could be a real possibility of an inadvertent button press that activates the WML and leaves it with dead batteries when you need it most. 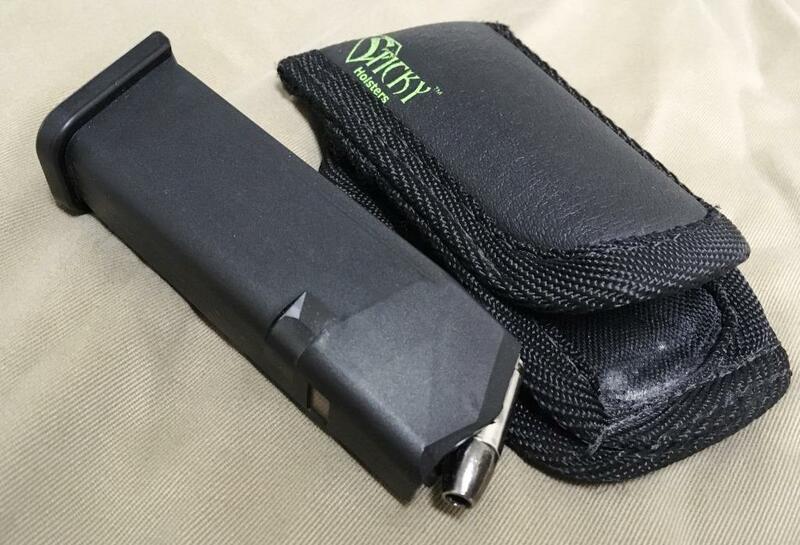 It wouldn't be rocket science to make a holster that will accommodate the size and shape of the Viridian WMLs, but if the batteries run down, all you have is that extra size and weight bolted onto your carry gun. Sticky Holsters did a great job on this holster. 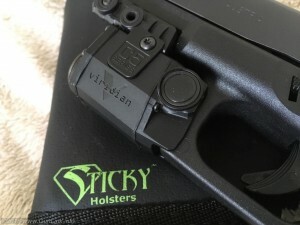 It looks great, the addition of the ECR insert is clearly not a hack job or afterthought, and it has the usual benefits of Sticky's clip-less holsters but give the ability to use the Viridian WMLs with peace of mind that you won't be running down the batteries lighting up the inside of your pants.